Dr. Stephen S. is many things and has many talents: well educated, intelligent, a celebrated musician and a wonderful husband, stepfather, and stepgrandfather. 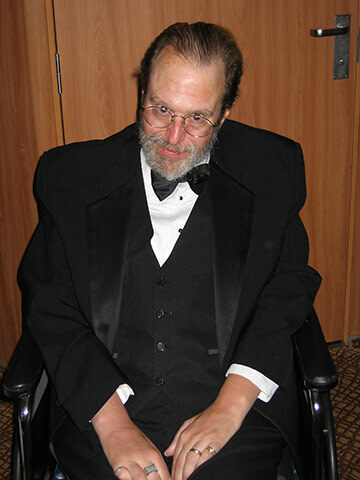 Prior to his diagnosis of ALS, Stephen, who has his PhD in organic chemistry, worked in biomedical and pharmaceutical research for over 20 years. He has been classically trained in playing the clarinet since age seven and also played the banjo and guitar throughout periods of his life. Ironically, it was his love for playing music that eventually led to his diagnosis of ALS. Beginning in 1991, Stephen realized his fingers did not feel quite right when he was playing the guitar. After many appointments with neurologists and other specialists, he was diagnosed with lower motor neuron disease. Eventually, though, as his symptoms progressed, Stephen was correctly diagnosed with ALS years later in 1997. Stephen, a researcher at his core, became involved with as many clinical trials as he could. He also became part of the peer review panel for the Department of Defense reviewing grants and providing his opinion based on his experiences with the disease. 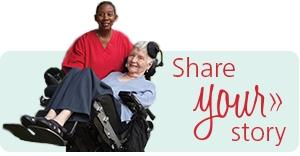 For many years, Stephen and his wife, Trish, managed Stephen’s care at home by themselves and participated in as many advocacy opportunities as possible. However, when Stephen’s symptoms worsened and he began using a wheelchair full time, they knew they needed more help to keep Stephen safe at home. That’s when they called BAYADA. Throughout Denise’s time with the family, she has seen Stephen’s symptoms progress and quickly adapts to his changing needs. Just as importantly, she has become not only a friend, but truly like family to Trish and Stephen, making it possible for Stephen to attend holiday parties, luncheons, and other functions with Trish. 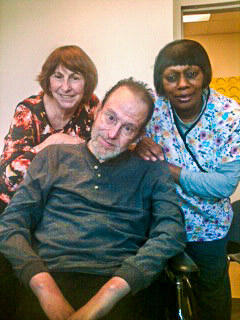 Denise helps Stephen keep up with the things that he loves, as she knows that his ALS diagnosis has not affected his mind. She helps Stephen use a computer to write classical and ambient music so he can still enjoy the pastime he has loved so much since childhood. She also helps Stephen continue to be an advocate for people with ALS by attending events with him, and helping him use his assistive communication devices to spread his message. Although Denise is very knowledgeable about the disease, she continues to learn even more so she can always help Stephen at the highest level. 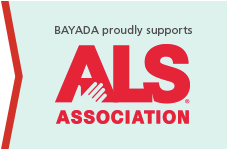 She completed the BAYADA ALS training which taught her additional ways to best support Stephen and Trish, and to understand how transitioning to a new disease phase affects Stephen both physically and emotionally.